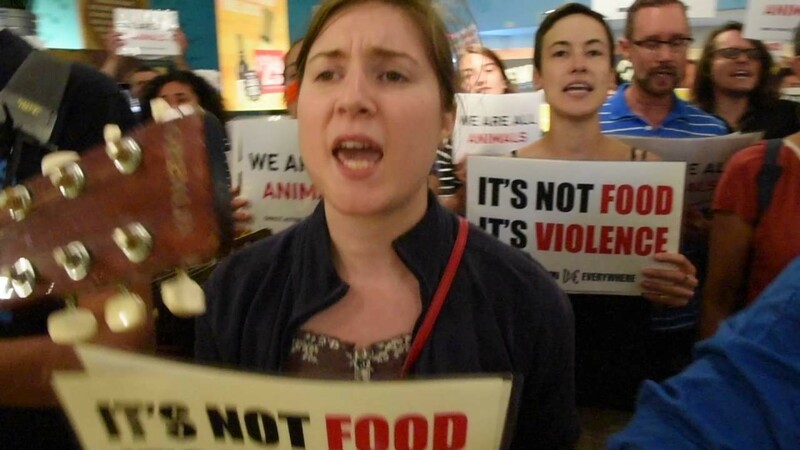 The animal rights group Direct Action Everywhere staging a protest in the Berkeley Whole Foods Market (via Youtube). Buried way down on the consent calendar for the July 19 Berkeley City Council meeting is a somewhat surprising item — a recommendation to abolish the Lychee and Dog Meat Festival, which takes place every June in the small city of Yulin in Guangxi, China. Sponsored by Councilmember Kriss Worthington, the item calls for an end to all “consumption, illegal trade, killing, and abuse of animals” related to that festival. I’ll admit the first thing I thought when I read the motion was: Why does the city of Berkeley feel a need to comment on what a handful of Chinese people some 7,000 miles away choose to eat or not eat? And, perhaps just as relevant, who in China would even care what anyone in Berkeley thinks? I’m of two minds whenever I hear American activists and politicians make a big show of how horrified they are by Chinese cultural practices like eating dog meat or shark fins. On the one hand, I get it: I like dogs, too. And many accounts indicate that the Yulin dog meat festival goes way beyond the pale, in terms of the cruel treatment the dogs suffer before they’re killed. On the other hand, isn’t there room to acknowledge that different cultures have different norms about which animals are acceptable to eat? And moral grandstanding against Chinese dog eaters — a relatively small percentage of people in China — only helps feed into a certain kind of racism and xenophobia. Ask any Chinese American or Korean American about the dog-eating jokes they had to endure growing up. This is the kind of mindset that led animal rights activists to stage their protest against this year’s Yulin festival in New York’s Chinatown — you know, outside of restaurants that don’t serve dog meat and don’t have anything to do with this particular festival. When reached by phone, Councilmember Worthington said the resolution was in keeping with Berkeley’s long tradition of weighing in on a wide range of state, national, and international issues — “we oppose all kinds of wars,” he said by way of example. In this case, Worthington said the point wasn’t so much to try to influence Chinese government policy as much as it was to stand in solidarity with animal rights activists in China, who themselves have been working to abolish the Yulin festival. And there actually is a Berkeley connection in this case. Worthington said the Yulin Festival was brought to his attention by a Berkeley animal rights activist named Amy Halpern-Laff. Halpern-Laff, as it turns out, is a member of Direct Action Everywhere, a fairly radical, mostly Berkeley-based animal rights organization known for its highly publicized “open rescues” — wherein its members travel to the self-proclaimed “darkest, most dangerous, and most secretive places on earth to stop violence against animals.” Apparently, the co-founder of the group, Wayne Hsiung, went into Yulin this year and rescued three Chinese field dogs — Oliver, Lao, and Xiao. According to Halpern-Laff, the official stance of Direct Action Everywhere is that “exploiting dogs is no better or worse than exploiting other animals,” she said. For that reason, the organization has been using the hashtag #YulinIsEverywhere — to make the argument that killing pigs and chickens for meat isn’t okay, either. That’s fair enough — though again, there does seem to be an outsized focus on a relatively small festival that takes place once a year in China. My one dog meat story: Several years ago, I visited a restaurant that my cousin had recently opened in the countryside in the Guangdong province of China. The gimmick of the place was that it specialized in live animals, so there was a makeshift hut where the restaurant kept dozens of different kinds of animals — chickens, snakes, rabbits, goats, and, most heartbreakingly, two adorable baby foxes. You picked out your dinner, and the staff would quickly slaughter the animal outside before delivering it to the kitchen to be fried or grilled or whatever. The sight of that lineup was a shock to my delicate American sensibilities — though, to be fair, it doesn’t seem right to eat meat unless you’re okay with the idea of animals being killed. Still, I kept sneaking horrified looks at those poor little foxes. Out of morbid curiosity, I finally asked: What in the world does fox taste like? Is it like mutton? That, right there, was my lesson in cultural norms. For dinner that night, I mostly ate shrimp, which had been steamed live. They were the best I’d ever eaten.